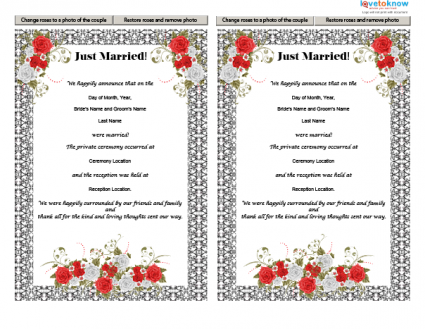 Free printable announcements for a wedding are an economical choice to reduce wedding costs. Wedding announcements are a way to inform people not invited to your wedding of your happy union. They can also be used as invitations to a post-wedding reception. The free wedding announcements provided here can be accessed by selecting the photos or their captions below. The announcements will open using a PDF program, so be sure you have one like Adobe Reader on your computer. Save the programs and print when you are ready. 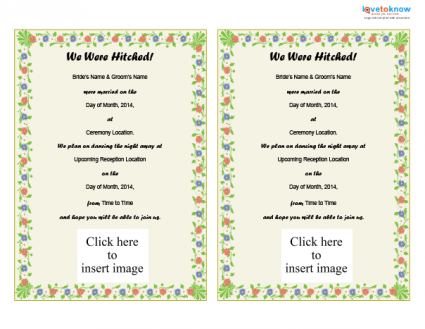 The wording on these documents can be customized to suit your specific wedding details. Each of these announcements contains areas for the couple's names, ceremony and reception locations, and wedding date. Additionally, there is space to add a photo to both announcements. Each one has a slightly different method for adding the photo, so follow the directions provided below. This announcement is perfect for couples who had a formal wedding or who do not wish to use a personal photo. Use the "Change roses to a photo of the couple" button at the top of the invitations to swap out the rose bouquet at the bottom of each invitation if you want to add the photo. If you decide not to use the photo option, you can easily remove it and use the bouquet by clicking on the "Restore roses and remove photo" button at the top. Click to personalize your announcement. Choose this announcement card if you had an informal, outdoor, or country wedding. Select the box that says "Click here to insert image" to choose an image from your computer and upload it into the announcement. If the announcements above don't suit your style, check out the announcements on these sites that are offered in a variety of formats and styles. Snapfish offers just married cards that can be printed from home. Typically, cards are 5x7 and allow users to input one or more photos of their choice prior to printing. For example, the Wedding Just Married Damask Card is a flat card upon which users can add four personal photos and provide wedding details on the right side. Also, the Just Married Monogram Initial Box is a folded card in which photos and the couple's monogram appear on the front and wedding information inside. To use any of the company's cards, select the one you like and you will be taken to a customization screen. Upload and add the photos you would like on the card. 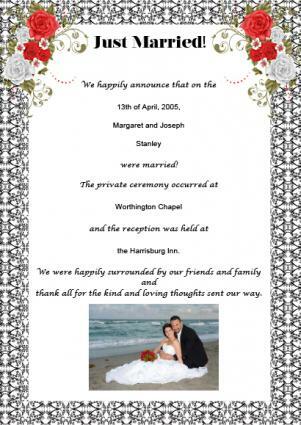 Then provide the wording and wedding details you would like to share. Smilebox's free wedding announcement cards are mixed in with its invitations and other wedding-related printables. For example, the company offers a Flowering Vines announcement and a Quatrefoil announcement, both of which are customizable. To use these printables, users must first download the company's free software from the website. Then each card can be customized with the photos and wedding information of the user's choice. Using free printable wedding announcements can help budget-conscious couples trim their wedding expenses. With many different companies offering a variety of options for printing, it is easier than ever to make your own wedding announcements.